Anandtech - "Investigating the Galaxy Nexus LTE Signal Issue"
Excerpt: "Ive been running battery life tests on our LTE Galaxy Nexus review unit since release day (a process that takes a considerable amount of time and results in our reviews posting a while behind everyone elses), but have had some time to run tests and gauge subjective performance. I found that LTE connectivity and performance felt above average, subjectively, and noted that in a tweet. After complaints started to surface, I spent a considerable amount of time reading the threads on XDA and other places around the web trying to discern what the complaints are about. Ive seen a couple of big misconceptions that I think really get to the heart of the matter." majiklantrn, ultravisitor, Tom in Bristol and 6 others like this. Additional Excerpt: "The issue here is that on basically all of the LTE/CDMA Verizon handsets, the field under Signal Strength in about refers to EVDO signal strength, and not LTE signal strength. The two arent comparable at all for a host of reasons - different spectrum (800 MHz and 1900 MHz for 1x/EVDO as opposed to 700 MHz for LTE), and different cells (theres some correlation, but not every Verizon base station has LTE onboard). The end result is that if youre comparing 1x/EVDO signal strength to LTE signal strength, youre making an absolutely meaningless apples to oranges comparison." Arrgggh.. you beat me to it!!!! It was a pretty interesting article. I trust Anandtech's testing more that some regular joe sitting at the kitchen table with his wife's XYZ phone comparing signal strength. It's not to say some people don't have issues, but don't use the signal strength as the absolute gauge. Plus now when someone posts "my GNex is -200 and my Razr is -80", I can post "well, you are probably comparing EVDO signal to LTE, apple and oranges". ohiomoto and jhtheking like this. Don't say Apples... you might upset the Apple Fanboys out there. LangHoo and jhtheking like this. I believe the patch will fix the stability of the 4G jumping around. When I spoke to the Verizon rep, she said that is what most of the calls (27) at the time were about. So far I'm happy with the phone, just want my case! I just read that article, and agree with Brian's point that some comparions which GN users have been making actually may not be accurate. At least, according to his statement, comparison with Charge or Bionic may not be a good fit. As you can see, throughout the test with different signal modes, two equipment showed some differences constantly, not too much like 30dBm as other members claimed, though. As Brian mentioned on his blog, with the existing slight signal difference between GN and others, the different way to display bars and signal strength in GN may have further provoked users' frenzy about this issue. At fringe areas, however, this slight signal strength difference could make some significantly different results. In my office, which usually showed 1~2 bar with signal strength -105~115dBm with my previous Thunderbolt, my GN also shows 0~1 bar with signal strength -115~120dBm. Yes, it is slightly lower. To sum up, it appears that there IS AN ISSUE with the signal strength with some GNs. Some comparison tests performed by users, however, may not be accurate due to the difference in displaying signals from phone to phone. I feel a link to my thread from early December is relevant to this. It is VERY good to see that it looks like LTE signal is properly being mapped now. Very, VERY good for applications that rely on the LTE signal strength figure, such as Sensorly. The signal strength is a bittersweet reality, of course. Now we get to see how terrible LTE coverage really is in a lot of areas. Verizon has gotten away with this for so long because of the way LTE is designed -- it performs better even in fringe areas than 3G, so a lot of times people don't realize how close to no LTE coverage they really are, whereas on 3G it was definitely noticeable. Now, people will be able to see how well Verizon has really covered an area with LTE. This does seem to go along with my observations this weekend. I traveled all over the state of Michigan. I saw 4 bars of signal strength for a total of maybe 10 minutes during multiple hours of interstate highway and inner-city travel. 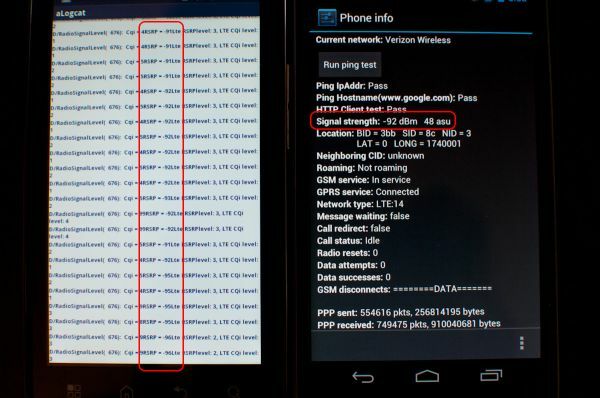 I was absolutely flabbergasted, and figured that was just the result of some software bug in the Galaxy Nexus which resulted in a 20 dBm difference in signal strength. But this all makes sense now. There are estimates that Verizon puts LTE on every 2nd or 3rd tower in a lot of areas. LTE signal will travel a little further under the same conditions as 3G (at least on VZW's frequencies for the two networks), so they can get away with this for the most part. This is how Verizon has been able to expand it's LTE network so fast -- they cover only the most crucial towers as their programs instruct them to, and then they move on to the next locale, and only come back when they decide they need to (or when enough people complain about crappy coverage). The author of that article says that it is likely that Google/Verizon will "remedy" this problem with a placebo -- perhaps by reverting to the old 1X display, or by artificially increasing the number of signal strength bars displayed, ala the iPhone awhile back. This would be unfortunate, as the author says. I only hope that this will convince Verizon to maybe take a step back and think about what they're doing in terms of their LTE rollout. But I'm realistic, and realize that's a freaking pipe dream at best. Now, as for my complaint about the article: The author seems to dismiss the idea that there is an actual signal strength problem with the Galaxy Nexus. While many of the "problems" that people seem to be having are likely related to this display of LTE signal strength instead of 1X as on previous LTE devices, there is still a serious problem. Everyone I've talked to is connecting to 4G in fewer places than with their previous devices. In the office I work at, with my Thunderbolt there was one single interior room where I would drop to 3G. Now, there are multiple interior rooms and hallways in which I revert to 3G. I can only hope that Samsung's radios aren't that bad and that there is a software issue that can be remedied in a future update. 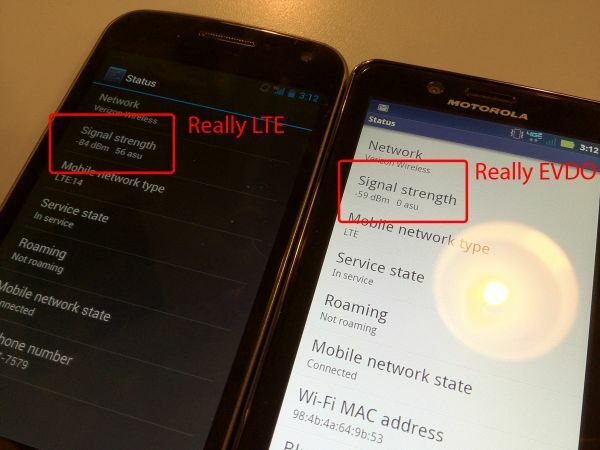 tl;dr: FINALLY LTE devices are displaying LTE signal instead of 1X. Article brings up good points, but author is mistaken in claiming that there isn't an actual problem with signal on the gNex. The issue here is that on basically all of the LTE/CDMA Verizon handsets, the field under Signal Strength in about refers to EVDO signal strength, and not LTE signal strength. In other words, when the Thunderbolt is in LTE mode, it's STILL displaying it's 3G connection. Notice that the Galaxy Nexus' 3G connection is the exact same as your Thunderbolt's "LTE" signal? Yes, your Thunderbolt goes down to -82 in 3G mode, but that's not a very high variance. It's possible if you tested it 30 seconds later it would have been at -90 again. Everybody in every one of these signal threads needs to read the full article. In it, you can see that Brian actually has to run a logcat to get true LTE signal strength readings on the Bionic because it only displays 3G signal strength under "About Phone." For the Charge, he has to hack into a special menu in order to reveal it. And lastly, this is exactly why Anandtech's phone reviews are the only reviews I actually rely on when making any sort of purchasing decisions or judgments. MazoMark and Mooem like this. Except, had you read the article carefully, you'd know there actually isn't. He compared the recorded signal of the Nexus with the Bionic and Charge, and the signal the nexus receives is IDENTICAL (and in some cases, better) than the other two. Where there are differences, it has to do with the different specifications of the radio compared to its predecessors. (he explains this in the comments) Some of the changes can be reverted in software, but the Nexus is one of the first Verizon handsets that is very accurately depicting what 4G coverage is like. Also, I would take the word, and technical review, of any of Anandtech writers over any forum dweller here. No offense to you guys, but those guys actually know what they're talking about. LangHoo, Tom in Bristol, MazoMark and 3 others like this. As a matter of fact, for Thunderbolt, there is an app called "LTE On/Off" which shows pretty much all the info of LTE/EVDO/1xRTT signal strength. I used it for my Thunderbolt. In the comments he makes it clear the handoff threshold for the Nexus is lower than the Charge and Bionic. What that means is that in a weak signal area, the Nexus will revert to 3G faster than the other two because it is the better signal. (and that would actually improve battery life) But, its just a software setting that they can change easily, and probably will. They could also attempt to boost signal on the handset itself, but there are limitations because of the devices FCC certification. I read the article, but it still doesn't account for real world experiences of those who have lost signal or dropped calls on their GN in areas that otherwise worked normally on other phones. This is beyond just a signal reading on a phone. There is a real problem with the GN holding a signal in areas where other phones work. Wow! Very interesting. But there seem to be too many reports of people dropping 4G that didn't with other 4G phones. New radios are coming in 4.0.3. Be patient. LangHoo, karn101 and Mooem like this. I don't think you understood what I was saying, though I probably didn't word that as well as I could have. The problem with the signal, as I put it, is probably a problem with the baseband/radio. The device is accurately displaying LTE signal strength, at last. This is a good thing, even though it may break some hearts. The problem is that the Galaxy Nexus is dropping LTE and switching back to 3G in many areas where other devices (my Thunderbolt included) had NO problem at all. The boiler room in my office? Thunderbolt would pull down 18 Mbps on LTE in there. The Galaxy Nexus? Reverts to 3G. REGARDLESS of the dBm indicated by the device on either 3G or LTE, the Galaxy Nexus is not staying on 4G LTE in many places where other handsets had absolutely no problem at all. Again, that's ignoring what any signal strength may have said, as we've already established that it was all smoke and mirrors. The dBm discrepency on 4G LTE was never a "problem" -- the Nexus is just accurately reporting LTE signal strength. This is GOOD. The signal strength "bars" were like the points in Whose Line is it Anyway on all devices before the Galaxy Nexus - they didn't matter. Now they do. This is GOOD. IGNORING WHAT THE BARS SAY/SAID ON BOTH THE GNEX AND OLDER DEVICES, the Galaxy Nexus is having a hard time keeping a 4G LTE connection in many places where older devices remained connected to LTE and had impressive speed tests with no data problems at all. This is VERY VERY BAD. I know he mentions the handover cutoffs are different for each device, but it seems like the cutoff for the Nexus is dramatically different from its 4G LTE predecessors. It's not just a device difference, which we all have some sort of tolerance and understanding for. It's way beyond that, and that's the problem that everyone is hoping can somehow be remedied via a software update. edit: You ninja'd me and snuck in your last post while I was typing this monster. Your last post was basically my last paragraph. Like I said, we're not arguing anything different here, I think you just misunderstood me, though that was through no fault of your own. Not quite. To this day, there is no way to accurately get the LTE signal strength on the Thunderbolt. Select other LTE devices had a special/hidden menu in which you could access this value separate from 1xRTT signal (that picture of the Revolution's menu comes to mind), but the Thunderbolt (to the best of the community's knowledge) has no such feature/ability. Exactly what I'm saying. The author made great points and came to mostly great conclusions in his article. But aside from data problems, the Galaxy Nexus in some areas is having voice signal problems. That's not an issue of cutoff thresholds for 4G/3G, that's an independent issue. Hopefully there is something else in the software than can be altered to alleviate this problem, and hopefully it's not just a terrible Samsung [hardware] radio. In the last month, I've had a D1, a Razr, and this GN. It's not just an LTE issue..... there is only 3G where I live and where I work, and the signal strength is significantly weaker and more unstable on my GNex. It seems to have gotten a little better over the last few days, but I still suffer from data drops and slower download speeds than with the two Motos. Still my favorite phone, though. Haven't tried it on 4G yet, but wifi connection and speeds are on par with the Razr and far superior to the D1. Read the comments on the first page of the article. The author says that this isn't an issue, but rather how the radio itself is programmed. Basically, that the radio was specifically programmed to default to 3G at a certain signal level, which is, for whatever reason, lower than previous devices. But that in and of itself isn't a problem with the radio, or a problem with it staying connected. Its how the radio's software was written, and how Samsung/Verizon intended it. LangHoo and MazoMark like this. Haha, and I guess I ninja'd you with my edits. I saw that bit, and that makes me a little more relieved. Assuming there isn't just poor radio hardware preventing anyone from doing so, they could easily change the software to allow weaker 4G LTE signals to be accepted by the device before it automatically switches back to 3G. Other than the aforementioned battery life issue, I can't see why they would intend for the device to behave this way. I, for one, would love to see a connection option -- prefer battery life, the cutoff threshold is a higher dBm figure. Prefer 4G LTE, cutoff threshold is a lower (more negative, that is) dBm figure. edit: All-in-all, I'm really ridiculously happy that the Galaxy Nexus is reporting accurate LTE signal strength. If I understand everything correctly, this should enable Sensorly (and other applications) to begin mapping LTE signal strength, rather than just LTE coverage. Just a clarification; on Verizon voice calls (as well as texts) use 1x and are NOT dependent on 3G or LTE. The fact a phone loses the basic signal for voice calls speaks to a greater signal issue with the phone, especially when most other phones do not experience the same issue when used in the same areas. The million dollar question is can it be fixed with software or is it a hardware issue? Well here is the deal if dbm is anything to go bye than yes lte signal on nexus is around 10-15 less than razr. 3g signal however is much closer. I have not had any drop backs to 3g yet from 4g. I am in a good coverage area. I am not complaining but I will take any improvement as a plus. You shouldn't be worried about dBm comparison between RazR and Nexus. Motorola uses their own Category 2 LTE baseband chipsets which will max out under 50mbps. Everyone else including Samsung uses Category 3 LTE baseband chipsets that can go up to 100mbps but are limited by Verizon's 10Mhz channels to 73.6mbps. Real world peak speeds up to 70mbps, easily 50+mbps all day long here in NYC. So as long as your LTE performance isn't affected you shouldn't be worried about the dBm reports.